Do you know why we use five elements in Feng Shui and BaZi/Four Pillars astrology to help balance your environment – and your life? In Chinese Metaphysics, everything on earth contains energy associated with these elements and together they define and complete the natural cycles of the world. There are yin and yang versions of Water, Wood, Fire, Earth and Metal that contribute even more detail to our understanding of the universe and where we fit in the big picture. Observe the transformations in nature that occur seasonally on earth and you will be well on your way to understanding the magnitude of this process. Water (Kan) is the element representing our career and journey through life – where we are going and where we have been. Water is associated with the colors black and dark blue, midnight, midwinter and the north. The yin to Fire’s yang, water relates to communication, resourcefulness and the fluidity of our path. Water energy is forever-shifting and reminds us to expect change and movement on our journey – to go with the flow. Water’s emotion is fear and all the unknown diversions that could potentially carry us off course. Wood (Chen) is associated with the color green, morning, springtime, and the east. Wood energy represents family, ancestors and new beginnings – our yesterdays and tomorrows. Like a tree, we are reminded to be anchored, yet flexible enough to weather the storm and still branch out toward the sun and into the future. The emotion associated with Wood energy is anger as a result of unrelieved stress. Because the nature of Wood is to expand, frustration sets in when growth is hindered, energy confined or progress slowed. Fire (Li) is associated with the color red, noontime, summer and the south. Fire energy is brilliant, exciting and warm. It represents our rank or fame – how the world perceives us and the image we convey to others. Like a steady flame, we are reminded to illuminate the path and share our light while maintaining enough equilibrium to prevent burning out. Fire’s emotion is joy and the passionate, sometimes reckless, abandonment of rules. Over stimulation, anxiety and restlessness are also the consequences of Fire. 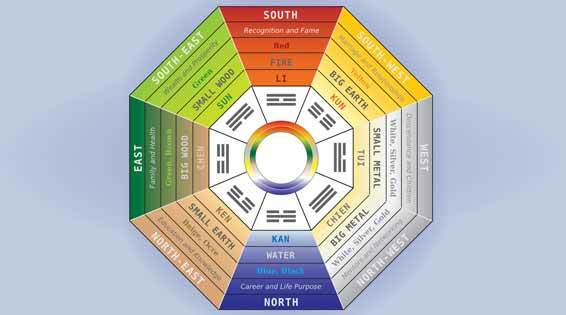 Earth (Kun) is the element in Feng Shui that connects all the other elements together. It is associated with the colors brown and yellow, afternoon, late summer, early autumn and both the northeast and the southwest. Earth represents our health and our ability to care for and nurture others. Earth energy transforms and, when balanced, keeps us centered, connected and grounded. The emotion of Earth is melancholy and concern for all beings who need our protection. Boundaries are necessary to prevent obsession. Metal (Chyan) is associated with the colors white and gray, evening, late autumn and the west. Metal energy is smooth, strong, precise and cool. It represents our ability to define our surroundings and to turn chaos into order. Metal reminds us to contract and consolidate our energy and look inward for many of the answers we seek. The emotion of Metal is grief and sadness for inability to reach perfection, hold on and to let go. Rigidity can rob us of the ability to yield, relax and forgive. Experiencing each of these emotions is normal and necessary to live a balanced and rewarding life. They phase in and out of relevance through the seasons and are most helpful when we allow them to surface, acknowledge their message and move on.